Cleaning gutters can be a tedious, time-consuming, and dangerous job. Don’t	let your gutters bog you down–we can help! Like all of our services,	our gutter cleaning service is stamped with a warranty. 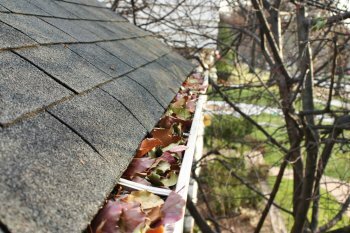 For the best protection,	we recommend a gutter maintenance program to reduce debris build-up on	a regular basis. Cleaning your gutters on a regular basis will help keep them in good condition	as well as discourage pest infestations. We offer several frequency options	for maintaining your gutters. Give us a call today to schedule a	free inspection! For Oak Harbor, call (360) 675-3235. For Bellingham, call (360) 734-2670. Visit our Contact Us page for more local numbers.